Unlike millions of others who were arrested and sent into exile during Stalin's era, the government did have ample excuse to arrest Ahmad Jafarzade because of his outspokenness and protest. Arrested in 1953, he was exiled for a seven-year term to Kolyma; however due to Stalin's death, he was released earlier. Some of these poems were found in the KGB files and obviously are some of the reason why they arrested him. This is the first time they have been published in English. Photo: Ahmad Jafarzade before his arrest in 1953. Since you came, hey Yusif . People have become strangers to each other, hey Yusif. You've locked us in prison before we even said anything. Our oil is the crown on your head, hey Yusif. Then you severed our tongues. You stole our girls and women. Where is so much tax ever levied, hey Yusif. "You've thrown a rock at our heads." You've made us shed tears. You've taken away our meat and pilaf. All we eat is "umaj"*, hey Yusif. You can set forth a decree to kill Ahmad. When your throne will be plundered, hey Yusif. * Umaj: A poor man's simple meal: flour mixed with water. Published September 2002 in "Bizim Asr" (Our Century) newspaper. I can't sleep well, thinking about the future. My enemy is strong, I cannot overcome him. Which I keep pursuing, but can never grasp. He'll never give up his quest for freedom. It seems to me that I'm in a daze. When the naive speaker says: "We have freedom!" It seems to me I'm in a daze. The one who separates Hadi* from us sins greatly. Every hour brings thousands of deaths. We mourn inwardly and celebrate outwardly. When they say: "The national press is free,"
This poem was first published in Azeri in "Bizim Asr" newspaper, September 2002. *Mahammad Hadi was a poet of the early 20th century who wrote poems in classical style. Basically, his poems deal with the idea of independence for Azerbaijan. He died in Ganja in 1918. His works were banned because he advocated independence. *Nabati was an Azerbaijani poet from 19th century. * Mashati Ganjavi was a poetess of the 12th century from Ganja in Azerbaijan. The author laments the fact that classical literature is no longer esteemed. New literary forms have replaced the old genres and the wisdom of the past. 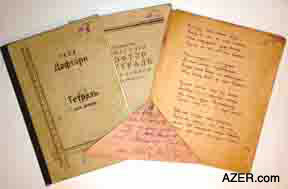 Photo: Notebooks containing his poetry were from the KGB files. They were used to convict him of anti-government activities. Note the triangular letter commonly sent from prison because envelopes were not usually available. No health, no strength, no life remains. No desire, no wish, no will. Mothers only wear black now. No solution, no health, no doctor. Many have been forced to leave the Motherland. Evil rules instead of Truth. No scientist, no Mufti, no wisdom. It's been so long since the lovely nightingales sang. Most people rot in Siberia now. No comfort, no judge, no king. The light of hope has been extinguished. All wealth is gone; nothing remains. Our rights, the will that once used to be, no longer exist. No fame remains, no Afghan [Ahmad's pen name]. No person is left to feel and think. Poetry translated by Gulnar Aydamirova and edited by Betty Blair.